Duryodhana (Sanskrit: दुर्योधन, literally means Dur= Extremely hard Yodhana= Yudh/Fight; the one with whom the fight is extremely hard) also known as Suyodhana is a major character in the Hindu epic Mahabharata and was the eldest of the Kauravas, the hundred sons of blind king Dhritarashtra and Queen Gandhari. Being the first born son of the blind king, he was the crown prince of Kuru Kingdom and its capital Hastinapura along with his cousin Yudhishtra who was older than him. Karna was the closest friend of Duryodhana. Notably, Duryodhana, with significant assistance from Karna, performs Vaishnava Yagna when the Pandavas are in exile. He had power of 10,000 wrestlers. When Gandhari's pregnancy continued for an unusually long period of time, she beat her womb in frustration. This caused a hardened mass of grey-coloured flesh tissue from her womb. 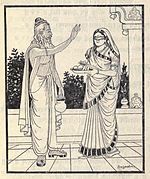 She implored Vyasa, the great sage who had blessed her with one hundred sons, to redeem his words. Vyasa divided the ball of flesh into one hundred and one equal pieces, and put them in pots of ghee, which were sealed and buried into the earth for two years. At the end of the second year, the first pot was opened, and Duryodhana emerged. Although loved by his family, Duryodhana and most of his brothers are not seen on the same level as the Pandavas in their adherence to virtue, duty, and respect for elders. Duryodhana feels that the partiality everyone shows to the Pandavas is only due to the circumstances of their birth. Duryodhana is mentored by his maternal uncle Shakuni, who masterminded most of Duryodhana's plots to humiliate and kill the Pandavas. Duryodhana's hatred for the Pandavas stems from his sincere belief that he being the son of the eldest brother and the then king is the heir apparent to the throne of Hastinapura. 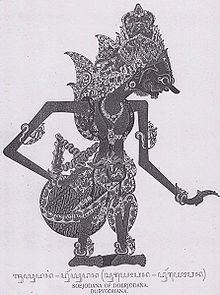 Because of his blindness, his father had to renounce the throne in favor of the younger brother, Pandu. Duryodhana deeply believed that what was rightfully his was being given away to his older cousin Yudhishthira. He also felt that the Pandavas were sons of Kunti and (devas/deities), not of Pandu. He never believed that their divine origin alone proved their superiority, on many occasions questioning their merits, and always calling them the 'Kaunteya' (sons of Kunti). He also bore a deep hatred of Bhima, who was younger than him but much stronger and dominated his brothers in sport and skill with his immense physical power and strength. When they were young, Bhima's bullying and taunting was a constant source of pain for Duryodhana and his brothers. Learning martial skills from his gurus Dronacharya, he proved to be extremely skilled with the mace. He then went to specialize in mace fighting under Balarama and went on to become his favorite pupil.Balarama described Duryodhana's body to be "lightning made flesh" and declares him to be the greatest mace fighter of his generation. At the martial exhibition where the Kaurava and Pandava princes demonstrate their skills before their elders, their guru Drona and the people of the kingdom, Karna appears and challenges an unsuspecting Arjuna, who is considered by Drona to be the best of the princes. But Karna is stopped when Kripa asks him to ascertain his lineage, as it would be inappropriate for unequal to compete. Karna, not being a kshatriya, hangs his head in shame. Duryodhana immediately defends Karna, arguing that it is actions, and not birth, that defines a warrior. Using the boon granted to him by Dhritarashtra, Duryodhana makes Karna king of Anga so that he is regarded as Arjuna's equal. Karna pledges his allegiance and friendship to Duryodhana. Neither of them know that Karna is in fact Kunti's oldest son, born to (sun god) Surya, before her marriage to Pandu. In the Kurukshetra War, Karna is Duryodhana's greatest champion and serves as commander from the fifteenth day. 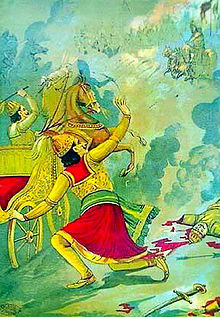 Duryodhana sincerely believes that Karna is superior to Arjuna, and will defeat his four brothers. When Karna is killed, Duryodhana mourns his death intensely, even more so than the death of his own brothers and was inconsolable. When Karna's identity is revealed to him, Duryodhana's love for Karna only grows and it is he, and not the Pandavas, who performs Karna's last rites. During their childhood Bhima used his brute strength to inflict injuries on the Kaurava brothers. As Bhima was gluttonous, Duryodhana, guided by Shakuni attempted to kill Bhima by feeding him poison, but Bhima survived the trap and emerged even stronger than before. Duryodhana then participated in a plot by Shakuni to burn the Pandavas at Varnavata; however, they managed to escape the trap having been warned by Vidura. 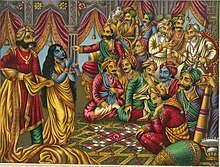 After the Pandavas reveal that they have survived the wax house, with a new wife to boot, Bhishma suggests that the kingdom be divided in order to ease the obvious tension. Yudhishthira is given half the kingdom and made king of Khandavprastha, so as to avoid a clash with the Kaurava princes over the whole Kuru Kingdom. Duryodhana becomes the crown prince of Hastinapura, and owing to the age and blindness of his father, he accumulates much control and influence, managing the state affairs himself with a group of his advisers that include his uncle Shakuni, brother Dushasana, Bhishma, Vidura, and Karna. But Duryodhana remains jealous of Yudhishthira, especially after the Pandavas along with Krishna transform Khandavaprastha to Indraprastha. Moreover, Yudhishthira performs the Rajasuya Yagna and gains the authority over several other kingdoms; Indraprastha's prosperity and fame appear to exceed Hastinapura's. 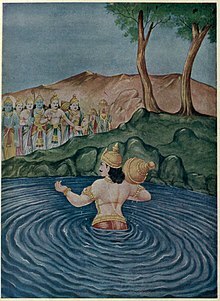 Duryodhana is unable to contain his anger, which is intensified when Bhima, Arjuna, the twins, and the servants laugh at him when he slips into a pool of water during a visit to Indraprastha. Draupadi insults Duryodhana by saying "Look what a pity the son of the blind man also is blind" this enraged Duryodhana and increased his hostility towards the Pandavas. Raging in jealousy by the prosperity and fame of Indraprashta and Hastinapura losing its fame made Duryodhana furious to throw down the Pandavas. To support his will, Shakuni devises a scheme to rob Yudhishthira of his kingdom and wealth by defeating him in a game of dice, which Shakuni cannot lose due to his superior skill over Yudhishthira's ineptitude and addiction to the game of dice. Unable to resist the challenge, Yudhishthira gambles away his entire kingdom, his wealth, his four brothers and even his wife, in a series of gambits to retrieve one by staking another. Duryodhana encouraged his brother Dushasana to drag Draupadi into the court. As she is Duryodhana's property after Yudhishthira had gambled everything away to him, Duryodhana tells Draupadi to sit on his left thigh, showing and patting it to insult her for revenge. Due to this action, Bhima swears, he would break Duryodhana's thigh. As an enraged Draupadi is about to curse the Kuru clan, Gandhari intervenes. Fearing retribution by the Pandavas, their allies, and history, Dhritarashtra and Gandhari reverse all of Yudhishthira's losses. But then (either through Duryodhana forcing his father to command the Pandavas to play again, or through Shakuni's vicious tricks he might have made Dhritrashtra to order them to play) the game is repeated. For this game of dice Shakuni sets the condition that upon losing, Yudhishthira and his brothers must spend thirteen years in exile in the forest before they may reclaim their kingdom. The thirteenth year must be passed incognito, or else the term of exile would be repeated. The Pandavas lose and begin their exile. In the Chaturdhari compilation, it is interpolated that Karna took up the task of establishing Duryodhana as the Emperor of the world (India). Karna embarks upon a worldwide military campaign, otherwise called Digvijaya Yatra. Bringing tribute and allegiance from all the kings ruling over in then India except Dwarika, Karna helped Duryodhana to perform the Vaishnava yagna to please Vishnu and crown Duryodhana as "Emperor of the World", as Yudhishthira did with the Rajasuya Yagna. No person in the entire universe, except Lord Vishnu, had performed this Vaishnava sacrifice. Duryodhana thus became the most powerful and the wealthiest man in the world. With the help of Karna, Duryodhana even made plans and preparations to conquer Indra, the lord of the heavens and the father of Arjuna in order to become the sovereign ruler of both heaven and earth. At the end of the exile term, Duryodhana refuses to return Yudhishthira's kingdom, despite the counsel of Bhishma, Dronacharya, and Vidura. Although Dhritarashtra openly criticizes his son, he tacitly desires that Duryodhana retain his throne. In a final attempt at securing peace, Krishna returns with the Pandavas' final proposal: the Pandavas would give up all claims to Indraprastha and Hastinapura in exchange for five villages. Scoffing, Duryodhana says he will not even give even a needlepoint of land to the Pandavas. Egged on by Krishna, Duryodhana attempts to arrest him. Krishna reveals his Vishvarupa form. The entire Kaurava court, save for Bhishma, Drona, Vidura, and Dhritarashtra (who was granted divine vision in order to see that by supporting his son, he was going against God), is temporarily blinded by the form. This confirms to those present that Krishna is indeed an avatar of Vishnu. Duryodhana, being vastly egoistic (in some versions of the story an outright atheist), brushes off the incident, not convinced of Krishna's divinity, and believing that strength of arms, not philosophy, would win him a war. With war inevitable, Duryodhana gathers support from his powerful vassals. The most legendary warriors – Bhishma, Drona, Karna, Kripa, Ashwatthama, Shrutyudha, even those who were critical of him are forced to fight for Duryodhana due to their previous commitments. He ends up amassing a larger army than his rivals. Shakuni also advises Duryodhana to seek Krishna's help. Duryodhana rushes to Dwarika only to find Krishna sleeping; he waits at the head of Krishna's bed when suddenly, Arjuna arrives with the same goal in mind. Arjuna waits at the foot of Krishna's bed. When Krishna wakes up, both Duryodhana and Arjuna appeal for his alliance. Krishna offers a choice of himself, completely unarmed, or the entire Vrishini army. Duryodhana proclaims that because he arrived first, he should get first-pick. However, Krishna says that because he saw Arjuna first and because Arjuna is younger, that Arjuna gets first choice. Duryodhana becomes worried but is overjoyed when Arjuna elects to reject Krishna's army in favor of Krishna alone. Joyously, Duryodhana returns to Hastinapura with the Vrishini army in-hand, only to be rebuked by Shakuni, who comments that Krishna is worth many armies by himself. Duryodhana also manages to win the army of Shalya, the maternal uncle of the Pandavas. Duryodhana intercepts Shalya's army as it comes to Kurukshetra and offers hospitality; Shalya accepts thinking Yudhishthira had made the offer. After Shalya has enjoyed Duryodhana's comforts, Duryodhana reveals the duplicity and indicates that Shalya is now indebted to him. He uses this indebtedness to extract Shalya's army and support. Duryodhana wanted Shalya mainly so that Karna would have an equivalent charioteer to Arjuna's Krishna. In the war, Duryodhana repeatedly eggs on the invincible Bhishma and Drona to forward his cause, even though his main hope is Karna. He desires to appoint Karna as his commander-in-chief; however, Karna and Shakuni point out that his already reluctant allies would much rather fight under Bhishma, an older, experienced, god-born, kshatriya than fight under a suta-putra. Reluctantly, Duryodhana appoints Bhishma as the commander in chief. When Bhishma falls to Arjuna, Duryodhana appoints Drona as commander-in-chief and orders him to capture Yudhishthira to win the war. On the thirteenth day of battle, his heir Lakshmana is killed by Arjuna's son, Abhimanyu, who proceeds to try and arrest Duryodhana. Duryodhana orders his soldiers to brutally kill of Abhimanyu, even if though it takes unethical means to finish him off. Duryodhana is repeatedly frustrated, as the Pandavas succeed in downing Drona, and is emotionally distraught when, on the 14th day, Arjuna, enraged by Abhimanyu's death, tears through the Kaurava army and slays Duryodhana's brother-in-law Jayadratha. Throughout the war, Bhima is steadily slaying his brothers, increasing his misery and bringing him closer to a defeat. Duryodhana's hopes are finally shattered when Karna is felled by the strategy of Lord Krishna and Arjuna. It is said that Duryodhana never shed a single tear for any of his real brothers except Dushasana who were killed in the battlefield, but when his beloved friend Karna was slain, he was inconsolable. Duryodhana appoints Shalya as the next commander-in-chief. On the final day of war, Duryodhana takes out his anger by smashing open Chekitana's head. As Shalya is killed by Yudhishthira, Duryodhana's paltry army-once eleven akshauhinis strong-breaks, and the army is essentially routed. Having lost his horse, Duryodhana leaves the battlefield. He cools his body by entering a lake, all hope of winning lost. Yet, he prepares for his final battle; for a death befitting a warrior on the battlefield and hoping to reunite with his friends and relations in the afterlife. He re-emerges from the lake after Ashwatthama and Kripa counsel him to face his destiny with courage. In some versions of the story, after Karna's death, Duryodhana doesn't even join his army and instead heads immediately to the lake. On the eighteenth day of the war, with his army reduced to himself, Ashwatthama, Kripa and Kritvarma, Duryodhana goes to meditate in a lake. When the Pandavas and Krishna eventually find him, Duryodhana tells them that he wants to gift the kingdom to them, and retire to the forest. Yudhishthira balks at the offer, telling him that Hastinapur is not Duryodhana's to gift. Instead, he offers that Duryodhana may pick any of the Pandava brothers to fight against one-to-one with a weapon of his choice, with the winner of the conflict the victor of the war. Despite his proposed advantage over Yudhishthira, Arjuna, Nakula, or Sahadeva with the gada, Duryodhana picks his nemesis Bhima. Despite Bhima's physical advantage, Duryodhana had the better technique due to his devotion to his craft. After a long and brutal battle between the two disciples of Balarama, Duryodhana begins to exhaust Bhima, and nearly makes Bhima faint. At this point, Krishna, observing the fight, calls out to Bhima and signals him by repeatedly clapping his own thigh with his hand. As intended, Bhima was reminded of an oath he had taken after the game of dice to crush Duryodhana's thighs. Bhima victoriously attacks Duryodhana with his mace and strikes his thigh, mortally wounding Duryodhana. After having his face insultingly kicked by Bhima, Duryodhana bemoans that he was slain by unfair means, given that it was illegal to attack below the waist in a mace fight. Infuriated at the violation, Balarama, the brother of Lord Krishna, raises his weapon to attack. Lord Krishna consoles Balarama, by reminding him of Duryodhana's evil deeds, and reprimands him for trying to influence a war he refused to participate in. Lying defeated, Duryodhana boasts to the Pandavas about how he will die a glorious death, about how he got to enjoy Hastinapur while the Pandavas were in exile, and about how he would now spend the afterlife in the company of his friends and relatives. He again eviscerates the Pandavas for all their chicanery during the war and decries their legacy. Venerating his own character, Duryodhana proclaims he will die happily. Then Krishna curses him to be evil person who has ever lived on the Earth and people on the Earth censure him for his wicked deeds he has committed towards Pandavas and Pandavas will be named as most righteous people who have ever lived n earth and due to his foolishness there was a wrathful destruction of entire Kurus and other kings who have fought in this war. Saying thus Krishna along with the Pandavas , Satyaki , left that place and returned to the Kaurava camp. Yudhisthira requested Krishna to go to Hastinapur to console Dhritharashthra and Gandhari who have lost all their 100 sons in the war. Upon reaching Hastinapur Krishna consoles the old parents and due to Duryodhana's foolishness there was a wrathful destruction of the entire Kurus . When the coast is clear, Ashwatthama, Kripacharya, and Kritvarma, having witnessed the fight and not wanting to interrupt so as to rob Duryodhana of his honor, come to Duryodhana's broken body. Duryodhana commands them to take revenge on the Pandavas, and to specifically kill all the Pandava brothers and Panchalas. Using the blood from his body, Duryodhana appoints Ashwatthama as the army's supreme commander. Already angry at the deceitful killing of his father Drona, Ashwatthama ambushes the Pandava camp at night. The three warriors lay waste to the sleeping, drunk, and unaware army. Other than those who had been staying in the Kaurava camp, few escape the slaughter. The trio rushes to tell Duryodhana of the news. After destroying the entire Pandava camp, Ashwatthama proceeds towards Duryodhana. At this point, there are many different versions of the interaction between Ashwatthama and Duryodhana. In some, Ashwatthama believes he has killed the Pandavas and tells this to Duryodhana, who is elated at the news. In others, Ashwatthama knows he has only killed the Upapandavas, but lies to his friend to make him happy in his final moments. In yet others versions, Ashwatthama tells Duryodhana that he killed the Pandavas' children, and Duryodhana is either happy that the Pandava lineage would die out, or distraught that the entire Kuru clan's future has ended. There is also a version of the story where Ashwatthama arrives to find Duryodhana already dead. Concomitant with Duryodhana's death, Sanjaya loses his divine sight, which he had been using to update Duryodhana's father Dhritarashtra. This symbolizes the conclusion to the war. According to the Mahabharata, after entering the svarga with a human body on Indra's invitation, Yudhishthira witnessed that Duryodhana "was seated on a beautiful throne and he shone with the splendour of the sun and around him stood in attendance the goddess of heroism and other entitys of righteousness". Yudhishthira found this insufferable and reminded the dwellers of svarga about his sinful deeds. Following that, Narada smiled at Yudhishthira and explained that Duryodhana had suffered for his sins, and that ultimately, Duryodhana was a warrior who had defended his dharma and fought bravely and valiantly. Not making Ashwatthama the commander-in-chief after the death of Drona. On hearing this Duryodhana closed all the fingers and rested. Duryodhana concluded that these 3 factors should have surely brought him victory. Had he built a fort around Hastinapura, he could have totally avoided the war in the first place. If Vidura had fought on his side, he would have had the best strategist, even better than Krishna. At last, Duryodhana came to the conclusion that Krishna was, in fact, the avatar of Lord Vishnu. If Duryodhana had named Ashwatthama the commander of the army after the death of Drona, victory would have surely have been his as Ashwatthama was born from "Ansha" of Lord Shiva. This would have countered Krishna. The remorse about under-utilizing Ashwatthama prompted Duryodhana to rethink and make Ashwatthama the commander of his army after his defeat. These events led to the complete destruction of the Pandavas' army. After the night raid of Ashwatthama on the Pandava camp, Duryodhana felt like he had won the war, as the Pandavas lost everything and everyone they cared about. Duryodhana is a popular choice of analysis. His merits, flaws, symbolism, and relevance are widely discussed. Urubhangam is a Sanskrit play written by Bhasa in the 2nd or 3rd century AD with Duryodhana as its primary protagonist. Written as a tragedy, the drama focuses on his point of view of the events of Mahabharata. His portrayal as a tragic hero is an especially unique within body of works in Sanskrit drama. Many Hindus believe that Duryodhana was the personification of Kali. Many critics argue that he is not without positives; many consider Duryodhana as a fair king and there are temples dedicated to him and the Kauravas. Scholars believe that like most other characters of the Mahabharata, the true picture is not black and white. His name is often mistaken to mean bad ruler, however his name is actually coined from the Sanskrit words "du"/"duh" which means "difficult" and "yodhana" which means "fight"/"war". So Duryodhana actually means someone who is extremely difficult to fight/defeat or wage war against. Duryodhana is viewed, by some, as the product of Dhritarashtra's ambition and also in a metaphorical sense, his "blindness". He is also praised for his adherence to his duties as a Kshatriya, and even in his last combat, fights bravely. He chooses to face Bhima in combat over all the other Pandavas, with whom he has an advantage in mace fighting. His skills in the mace are also praised; many stories call him the best mace-fighter of the age after Balarama. 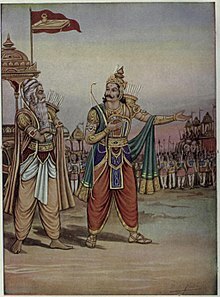 According to Mahabharata, when Bhishma has to pick Dhritarashtra's successor, he mentions to Vidura many of Duryodhana's positive qualities in comparison to Yudhishthira. Having spent so many years in the forest, Yudhishthira doesn't have Duryodhana's experience, military expertise, education, and courtly manners. Bhishma adds that Duryodhana is loved by the people, while Yudhishthira is an unknown quantity to them. However, Bhishma ultimately selects Yudhishthira, telling Vidura that in his heart, Duryodhana is a power-hungry, vitriolic individual, while at his core, Yudhishthira is a good man who cares tremendously for his people. The friendship between Karna and Duryodhana is considered to be a great one, and is used as an example of friendship and loyalty. In the epic, Duryodhana decries the means of discrimination employed by Dronacharya. He goes one step further to accord Karna a place among the royals, by crowning him the King of Anga and standing by him whenever anyone pointed a finger at his lower-birth. He seems to not care about the low birth of Karna and is the only one to vocally support Karna candidature in the archery contest without caring about caste inequality. When Draupadi refuses to allow Karna to string the bow at her Swayamvara because of his low birth, Duryodhana defends him saying "great sages, philosophers, and warriors have no source. They are made great, not born great". In a modern light, his disrespect for discrimination and blind following of tradition is seen more positively. At Poruvazhy Peruviruthy Malanada Temple in Kerala's Kollam district, Duryodhana is worshipped as the main deity. It is the only temple in South India where a Kaurava is considered a God. In the Kumaon region of Uttarakhand, several beautifully carved temples are dedicated to Duryodhana and he is worshipped as the deity. The mountain tribes of Kumaon fought along with Duryodhana in the Mahabharata war; he was venerated as a capable and generous administrator. There is a temple in Osla, Garhwal division of Uttarakhand. This was built by inhabitants of Saur. People believe he stayed here with blessings of Lord Mahasu to take care of the people. Lakshmanaa was the daughter of Duryodhana and Bhanumati. In the Hindu epic Mahabharata, Laxmanaa is the daughter of Duryodhana and Bhanumati. She had a twin brother named Laxman Kumara. Not much is revealed about Laxmanaa in the Mahabharata except her marriage to Krishna's son Samba. Duryodhana by Viswanathan Raghunathan (2014, Harper Collins). 1989 The Mahabharata (1989 film) N/A Belgium Australia U.S.
^ Gandhi, Maneka (1993). The Penguin Book of Hindu Names. Penguin Books India. p. 125. ISBN 9780140128413. ^ a b Kisari Mohan Ganguli (1896). "Mahabaratha, Digvijaya yatra of Karna". The Mahabharata. Sacred Texts. Retrieved 11 June 2015. ^ "The Mahabharata, Book 1: Adi Parva: Sambhava Parva: Section CXV". Sacred-texts.com. Retrieved 15 August 2014. ^ Geraets, Wil (2011). The Wisdom Teachings of Harish Johari on the Mahabharata. Simon and Schuster. ISBN 9781594779329. ^ Kisari Mohan Ganguli (1896). "Mahabharata - Karna conquering the entire world". The Mahabharata. Sacred Texts. Retrieved 11 June 2015. ^ The Mahabharata, Book 18: Svargarohanika Parva: Section 1. ^ Vignesh, Inba. "The Greatest friends ever lived - Karna and Duriyoudan". India - The Land Of Hearts. India - The Land Of Hearts. Retrieved 15 June 2017. ^ "Friendship". The Hindu. The Hindu. Retrieved 15 June 2017. ^ "Poruvazhy Peruviruthy Malanada | The one and only one Duryodhana Temple in South India". Malanada.com. Retrieved 15 August 2014. ^ "Shrine for Duryodhana!". The Hindu. 11 May 2017. Retrieved 12 May 2017. ^ Vanamali. The Complete Life of Krishna: Based on the Earliest Oral Traditions and the Sacred Scriptures. Simon and Schuster. Retrieved 22 May 2012. ^ "Indian Myth and Legend: Chapter XVIII. The Battle of Eighteen Days". Sacred-texts.com. 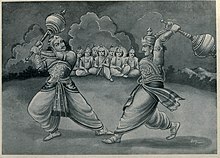 Wikimedia Commons has media related to Duryodhana. This page was last edited on 13 April 2019, at 09:58 (UTC).